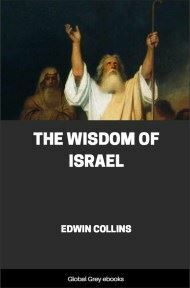 Published in 1910 as part of the Wisdom of the East series, this is a short collection of passages from the Jewish wisdom literature of the Talmud and Midrash. Each one of the 39 chapters contains a short parable or saying, most are only a paragraph or so long. 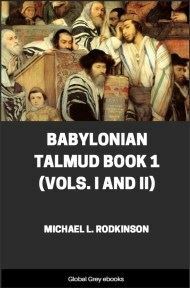 THE extracts from the Midrash Rabboth and the Babylonian Talmud, given in this little vol., are not the work of one or two authors, or of one age. They belong rather to the speech and feeling of a whole nation than to its literature, properly so called. 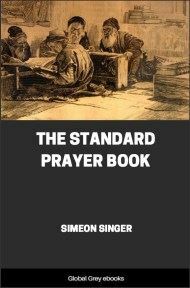 At first, impromptu utterances, or composed to be spoken in the course of sermons, popular addresses, the speeches of honoured rabbis at marriage feasts or in the houses of mourners, or in the rabbinic assemblies of Palestine and Babylon, these and thousands of similar parables, fables, legends, and more or less poetic playings of fancy around the facts of life, or round the popular thought and knowledge of their time and place of origin, lived in the mouths of the Jewish people, like the folk-lore and folksongs of other nations, and were orally transmitted from generation to generation for hundreds of years before being included in the compilations where we now find them, and in other works now no longer extant. Their survival, and their place in rabbinic literature, they owe to the fact that everything was brought into relation with the Bible or with the traditional laws of Israel; so that they became a part of the Midrash or study of Revelation. 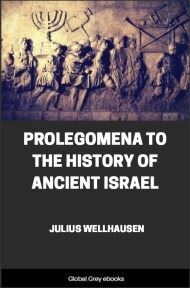 The terms Midrash and Talmud mean this study and interpretation of Scripture, especially of the Mosaic Law, together with its application to the changing conditions—mental and material—of the Jewish people. 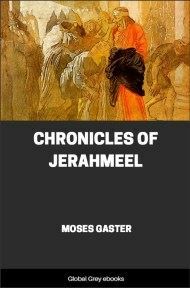 So widely inclusive and so many-sided was this "Study of the Law," which formed the chief mental activity of the Jewish people from the times of Ezra and Nehemiah until long after the final redaction of the Talmud in the 5th century, that there is hardly a single subject of modern secular study that was not dealt with—at least incidentally; for life, as a whole, was meant to be regulated by the Mosaic Law. Says Zunz in his Gottesdienstliche Vorträge, still the chief authority on the subject:—"Whoever applied himself profitably to, the various branches of Midrash was a jurist, a theologian, a man knowing in the ways of the world, a linguist, an orator—and if nothing was to be neglected, he must have no slight acquaintance with history, natural science, and astronomy." As a matter of course, specialization became necessary. But the oldest subdivision of this "Study of the Law" is twofold:—into (a) Halacha—practical rule of life, judicial decisions, the results and finished products of Midrash; and (b) Agadah—that which is spoken, and placed before the hearer, not as binding and having authority to guide him, either in practical life or in belief, but as presenting a vivid picture of ethical truth, of beauty, or of thought, linking the less obvious meanings of Scripture with the newer ideas and with the customs of non-Jewish peoples, and providing for the spiritual or moral needs of the moment. The Halacha was the transmission of the Mosaic Law in its application to material life; to civil and criminal law, practical hygiene, religious ceremonial, marriage and divorce, practical morality, the daily conduct of individuals and of the nation in every conceivable relation with each other, with the forces of nature, and with other nations of the world. Halacha claimed to be an exact and literal interpretation of the letter and spirit of the law given at Sinai, only modifying its details in so far as traditions dating from Moses and the prophets had provided for such modification, or where, hidden beneath the letter of Scripture, hints could be discovered, showing that its spirit actually demanded such modifications in foreseen changed conditions. Differences of opinion on Halacha must be discussed in the schools that combined the functions of a university and a parliament. Not so the Agadah. Herein was room, and full liberty, for the freest play of individual thought and fancy. As in Halacha, everything must be referred in some way to the Scripture. But here there was no obligation to interpret the revealed word strictly in accordance with its real meaning. As often as not it is some new light, borne in upon the teacher from his own experience, for which he seeks a reflecting or intensifying medium in the revealed word. As a poet uses natural scenery to illustrate the thoughts or emotions its aspect or his mood suggests, so the Agadists used the texts of the Bible. 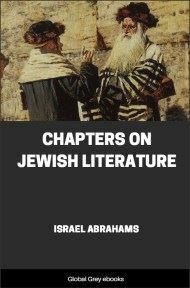 The Agadata were not the authoritative teachings of the rabbinic schools, but the occasional utterances of individual rabbis and teachers. Remarkable was the freedom with which verses of the Bible were often used to support views in consonance, truly, with the general teaching of the Bible, but not at all contained in the words themselves. The same rabbi would even interpret the same verse in different ways to meet the requirements of the lesson he wished to enforce. No harm was done; for every one knew that this was not peshat—simple literal interpretation—but only drush, or the homiletic use of Scripture. This method of dealing with Scripture flourished exceedingly among the teachers of the last century B.C. and in the succeeding two hundred years, and appreciation of this fact will help materially in the understanding of the New Testament. For instance, when the verse "Thou shalt not muzzle the ox when he treadeth out the corn" is interpreted as an admonition to support the preachers of the gospel, and it is added that "Moses took no care for oxen," this is simply an example of drush, and no one need accuse the New Testament writer of wishing to deny that, in peshat, this verse is one of the many strict injunctions to avoid all cruelty to animals—injunctions that form a prominent characteristic of both the Mosaic Law and the Talmud.